With less than nine weeks remaining until the SSE Airtricity Dublin Marathon on October 28, the athletics calendar is packed with 10-mile and half-marathon races - and last weekend was particularly congested. First up on Saturday was the Tullamore Quinlan Cup Half Marathon, where David Flynn of Clonliffe Harriers, who won the national half-marathon title a fortnight ago, was the class act of the field. Flynn's time of 68 mins 44 secs was a course record and shows he is well on target for a good time in Dublin. 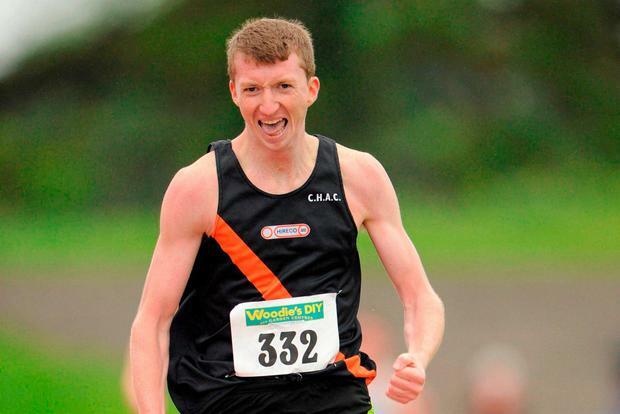 He aims to put in a few more weeks' training before running the Charleville Half Marathon at the end of September and then heading to Texas for altitude training. A minute behind Flynn for second place was Paddy Birch from Toronto, who finished in 69:26. A distant third in 72:13 was Mick Fogarty of Ferbane AC. First woman was Aisling O'Connor of Edenderry AC in 81:21. She was followed by her clubmate Caroline Donnellan in 84.17, with Emma Boland of Newbridge AC in 93:24. Newbridge AC won the Quinlan Cup as first team (mixed), with host club Tullamore Harriers second and Celbridge AC third. The race incorporated the Leinster Championships. Winning the Warrior's Run 15km from Strandhill to the top of Knocknarea and back in Co Sligo on Saturday was Jake O'Regan of St John's AC in 54 mins 44 seconds. A close second in 54.53 was local athlete John Paul Carty, who had led to the bottom of the hill. Former Irish international Deirdre Byrne of Sli Cualann, who has been off injured for a year or so, made a solid comeback when she finished first woman in 64.59, holding off the challenge of previous winner Heather Foley (65:35). A day later, Kevin Maunsell ran the fastest half-marathon time of the weekend when winning the Boston Scientific Clonmel Half Marathon in 67 mins 22 secs. Running in his home town, Maunsell's time put him four minutes clear of the chasers led by William Stephens of Coolquill AC. First woman in 88:27 was Linda Grogan of Dundrum AC. Also on Sunday, Freddy Sittuk, who is based in Co Wexford at the moment and is another aiming to run the Dublin Marathon, won the Oylegate Half Marathon in Co Wexford in a time of 77 mins 32 secs. Second in 77.39 was Joe Lillis of United Striders. First woman was Deirdre Ni Chearbhaill of Crusaders AC. Over the shorter distances, Mick Clohisey of Raheny Shamrock, who ran the marathon at the European Championships earlier this month, raced to victory at the Claregalway 10km. Clohisey finished in 30:27, with Conor Dolan of Galway City Harriers a distant second. First woman in 37:39 was Regina Casey of GCH. The big race this weekend is Sunday's SSE Airtricity Series Frank Duffy 10 Mile in Swords, which traditionally has taken place in the Phoenix Park. Entry is closed. If you prefer your races shorter, entry is still open for Saturday's Tony Donoghue Memorial 10km in Moone,Co Kildare, with T-shirts and donuts for all finishers.